Phoenix Obsidian Designs is attempting to provide various other Primitive Technological Replications. Currently we have the several bone tools offered below. If you are looking for some other specific replication please directly CONTACT US or use this Special Request Form (pdf) to obtain a quote. The process of grinding bone and antler against a rough stone served to manufacture Projectile Points of various kinds. The production of these tools was time intensive but the finished product was durable and had specific assigned uses. Offered here are Arrowheads which are approximately two inches in length and Spearheads which are three inches in length. The process of grinding bone and antler against a rough stone served to manufacture Knife Blades. The production of these tools is time intensive but the finished product is very durable. Offered here are blades of various lengths with a half inch stemmed base. No specific type of bone is guaranteed. 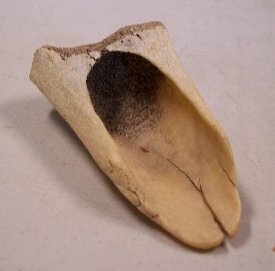 A specific ground point made out of an antler. It has multiple points along one side of its length. Approximately three and a half to four inches in length. The high price is a reflection of the high amount of labor involved in grinding down antler. A three piece gound bone point that is wrapped together onto a fore shaft. This composite piece was made for use in fishing. Durable awls, with either sharpened or dulled tips, were used for a multitude of purposes from leather working to basketry. These items were initially shaped by splitting a leg bone and then grinding the fragment. The handle section is wider and carefully smoothed and shaped for handling. Alternatively, an antler tip would be cut off a rack and the cut end was smoothed for handling and the tip end was sharpened. Needles, with either sharpened or dulled tips, were used for a multitude of purposes from leather working to basketry. These items were initially shaped by splitting a leg bone and then grinding fragments. The eye of the needle was formed by drilling. A unique variety was formed from a deer ankle bone which produced a lacing needle with little modification necessary. 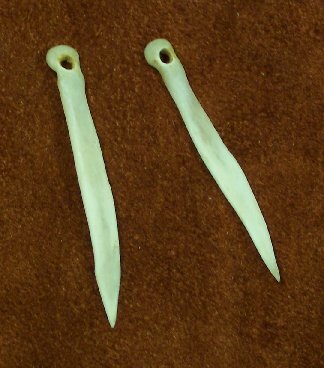 Bone Needles are offered here in four varieties - a large flat version with an eye hole, a smaller rounded version with an eye hole, a medium version which has a side notch end, and a deer ankle bone needle with an eye hole. These are individual bone fish hook types, coming within a labeled Riker Mount. The gorge hooks are sharp double tipped bone pins. The X and Composite Hooks are composed of two pieces. 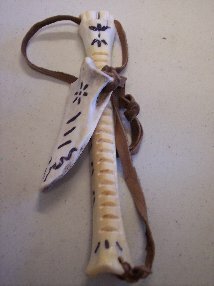 The curved fishhook is a special form made out of a deer foot bone. Visit the Displays page for a collection of these hooks. These artifacts made from either rib or shoulder bones that are shaped to be used as scrapers with handles wrapped with leather. Specific animal bone type is not guaranteed. This specific large bone tool is a naturally shaped bone that has been grooved into teeth along a sharpened edge. These is rounded one to two inch lengths of thick bone or antler that has been end sharpened to a point to be used as an arrowhead. The Bone Point Tip is rounded to insert as a foreshaft. The Antler Point Tip is hollowed for the shaft to be inserted. 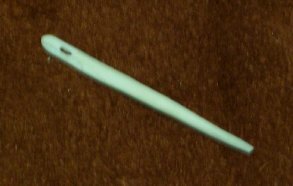 The Double Tipped Bone Pin could have been used as a hairpin, decoration, or as a foreshaft point. This is a rounded two and half inch length of thick bone that has a blunted end that can be used as an arrowhead for knocking birds out of the air. The opposite end is narrowed for insertion as a foreshaft. This percussion musical instrument is made out of a leg bone into which notches have been grooved. A stick or secondary bone is then run across the surface to create a unique sound. It has been decorated. This bone tool is a thick bone with a sharpened wedge shaped end for gouging into soft plant or other materials. This bone tool is a thick leg bone which has been hollowed out to act as a scoop. This large bone tool is of thick bone or antler that has been narrowed down to a wide wedge shaped dull end that can be used to pry apart wood or other materials when hammered. A length of leg bone that has been hollowed out with a cut out lid. Scrimshawed designed on the exterior.